Hello! It's Jennifer Larson, sharing the new Echo Park line Happy Camper. 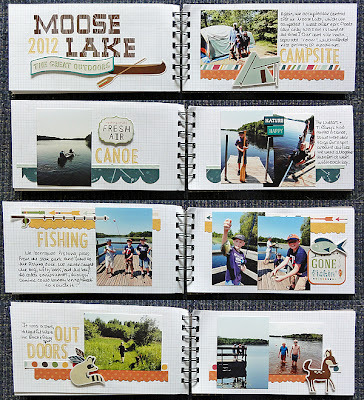 I love to camp, so I was delighted to work with this collection. Like most collections from Echo Park, there were multiple pieces of patterned paper, letter stickers, and shape and word stickers. I go camping at least once every summer, so this product would definitely be one I could see myself using every year. However, I'm picky about themed product: I MUST be able to use it on projects other than the theme. 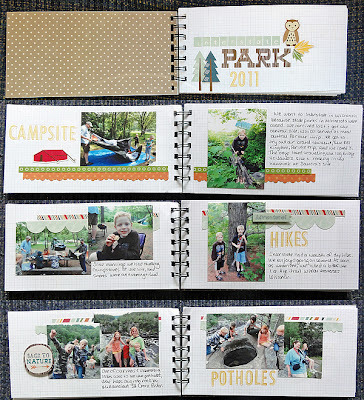 So I challenged myself to do only one project related to camping. 1. The collection's style and colors. Confession: I have a LOT of camping related products in my stash. I thought the colors and stickers were classic and cohesive enough to work with other collections I own. That's a big plus for me because I like to mix collections. 2. 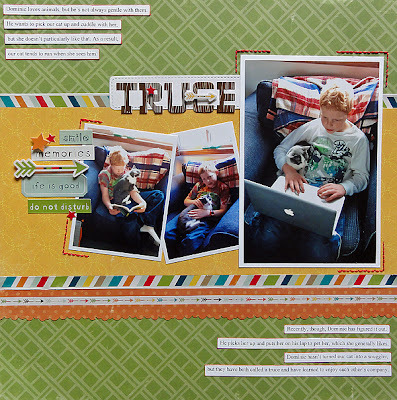 Versatile B sides to the patterned paper. Sometimes themed products are limiting because they have themed prints on both sides. Not this collection. 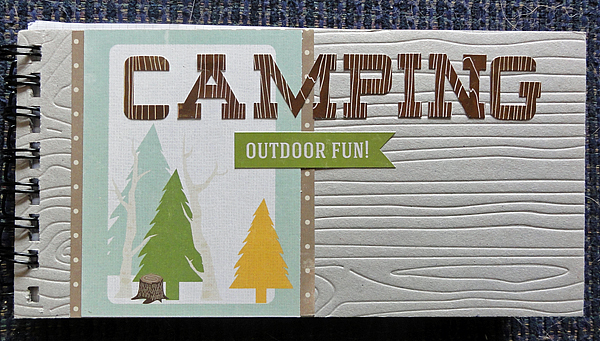 Every themed piece of paper had a more generic pattern on the back that would work for projects not about camping. 3. 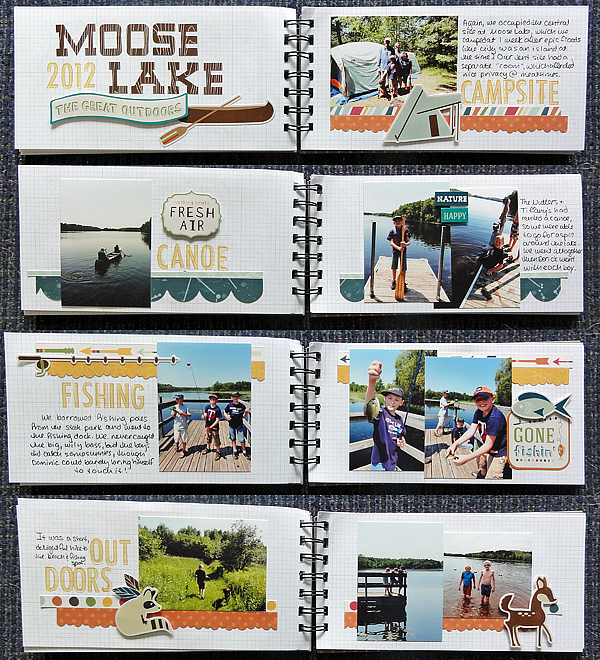 Variety of images in the stickers.When I scrap about camping, I like to tell the whole story. I liked that there were a variety of images so that I could tell the full story and not have to dig through my cut files or stash to find the perfect accent. 4. Different letter sticker sizes. Another confession: in past collections (not just Echo Park) I've noticed letter stickers sheets containing only one size of letters. While that's nice, I love mixing sizes and styles of letters. This collection had a large and small size of letters, which made it easier to mix. 1. The small letter stickers are hard to read. If the print had been a darker color, it would have been easier to read. In white print, it was difficult. 2. Sometimes big graphics on the A sides of patterned papers. This is just me--I admit it--but I generally prefer small patterns to big. Some of the A side patterns were so big and dramatic that I wasn't sure how to use them. I admit that's just my style and not really a flaw. 3. Only themed stickers. I am a label sticker gal. Give me a blank label sticker and I can use it on any page. I wish there were more blank labels or generic word stickers in this collections. The paper was more versatile than the stickers, in my opinion. This mini album was my themed product. I made this mini to record my yearly camping trip with friends. I love using less dimensional accents for mini albums to make the album more compact, and the stickers were perfect for this. 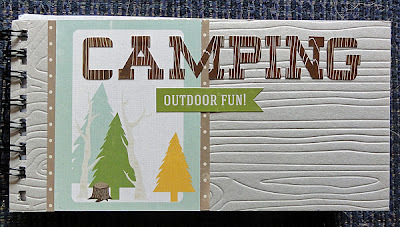 Supplies: Happy Camper by Echo Park, floss by DMC, Bumpy Road border punch by EK Success, ink by Jenni Bowlin, cardstock by Bazzill, Times New Roman font. This was my nonthemed layout. It was SO easy to make. Thank you B sides and the flexibility of arrows! "Have an Awesome Day Dad"
Supplies: Happy Camper by Echo Park, floss by DMC, cardstock by Bazzill, pen by American Crafts. 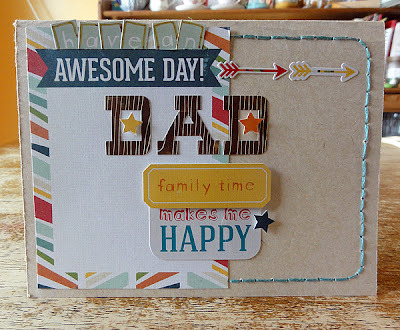 I made a card for Father's Day with this collection. The bold colors and patterns made it perfect for masculine designs. 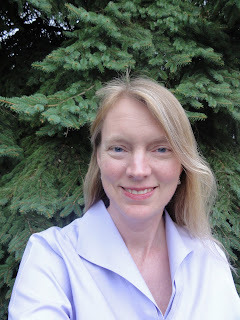 Thanks for sharing my review on the Happy Camper collection! Please share your thoughts about camping products. Do you buy themed products for the theme alone, or do you prefer them to be used on various projects? I have older camping photos that would be perfect for these! I just used this collection and loved it! We do alot of camping, so this was perfect for me! I find that the paper lines that I use the most have generic sides to the themed side. I could get a pack of Happy Camper and be satisfied that I spent my money wisely knowing that I can use all the paper up. I might buy a few pieces of a themed line for a project, but I would hesitate to buy the whole thing, because I need for my purchases to be versatile, more bang for my buck. That said, I love how Echo Park has thought about the b sides of these papers - the wood grain, chevrons, and other patterns - as well as the colors - I can totally see myself buying this collection for a variety of projects! i really love this collection and am so excited for it. your album is just stunning, thanks for sharing it! Camping is my favorite thing in the world, so this line is my favorite of theirs. I love everything about it. I like to make cards, tags, and mini albums about camping, and like to buy kits when they are great, so I will have everything from the line. I would love to have this one!!! I do buy themed collections for that purpose but in this particular case I would buy this because we are OUTDOOR people not campers but it would be perfect for any of our outdoor activities.